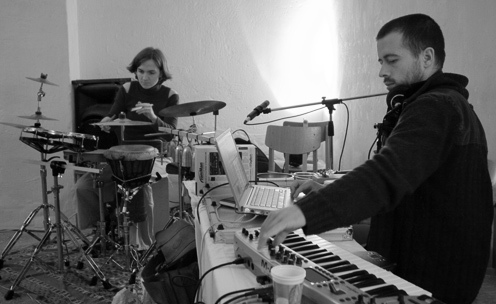 On june 7th there has been an astonishing set that was played by the new soundformation Quadrolux, consisting of Marcus Horndt and Nora Thiele. Nora graduated at the University of Music & Theatre, Leipzig in classical piano and percussion / drums. Today she is living and working as a musician and pedagogue in Berlin. Marcus graduated as well at the University of Music & Theatre, Leipzig and works in different musical formations as piano player and soundengineer. See his website for further information www.marcushorndt.de.